H.G. Wells is one of the most influential science fiction writers of all time. Among his many works are The Time Machine, The War of the Worlds, and The Invisible Man, which brought futuristic, new ideas to life and showed us glimpses of today’s, and tomorrow’s, World. Prof Chris Murray, University of Dundee, will explore the adaptations of H. G. Wells’ stories in comics, and will give an insight into the creative process behind comics. 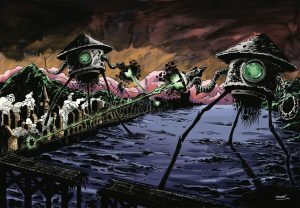 There will also be an opportunity to have a sneak peak of the new comic featuring adaptation of H.G.Wells’ stories being created at the University of Dundee. The talk and discussion will finish at 7pm. This event will be followed by a 30 minute special session demonstrating how to create your very own comic strip (no drawing skills necessary). This event is part of ‘H G Wells at 150: Hope and Fear’, a series of events that celebrate the great writer’s 150th birthday and is supported by the University of Dundee as the Scottish hub of the national Being Human festival (17th – 25th November).